Don't struggle to find something different on busy homogenous city high streets - enjoy shopping in the Yorkshire Dales, where your money goes further, you get service with a smile and every £ you spend goes into the local economy, supporting real people and families who love the Dales as much as you do! The Yorkshire Dales have fired the imagination of artists and writers for generations. Lewis Carroll and Charles Kingsley found inspiration among the meadows and ancient green pastures of Malham Tarn and Wensleydale. Turner particularly loved the area around Askrigg and Hardraw Force. Look out for work by modern artists such as Mackenzie Thorpe's square sheep in Richmond, Emerson Mayes from Nidderdale, Piers Browne in Wensleydale and Ian Scott Massie in Masham. Richmond is making a name for itself as the Yorkshire Dales' Capital of Culture so you won't be surprised to find several galleries and shops selling artwork and locally made crafts. Wander around the cobbled wynds and you'll find The Showcase Gallery, Lucy Pittaway, Mackenzie Thorpe Arthaus Gallery, No.19 Richmond, and Caroline Hudson. ​Down the hill is Richmond Station, now transformed into a gallery with changing exhibitions and the fantastic Shop at the Station which sells some really beautiful gifts from local makers. Every shop in Hawes is still proudly independently-owned. Look out for Stacey Moore Art who create intricate coloured pencil drawings featuring Yorkshire Dales animals and nature, the Old Grammar School Gallery, and an ever-changing, expanding gifts at the Mulberry Bush. The shop at the Dales Countryside Museum in Hawes has a small selection of locally made products while the nearby Herriot Gallery houses a frequently changing selection of paintings and other artwork by artists such as Peter Brook, Moira Metcalfe and Piers Browne. Both Sturmans Antiques and Cellar Antiques have a wonderful warm atmosphere and great range of beautiful and often unusual antiques. In Reeth a cooperative of local artists and makers has recently opened a new shop called Fleece. From here walk up the road to Silver Street and look out for Scenicview Gallery, full of awe-inspiring landscape photographs. Continue to the Silver Street Studios where you'll find Michael Kusz and his incredible sculptures, Stef Ottevanger's animal sculptures and Threshing Barn wool and weaving supplies. Back near the Green is the lovely, cosy and quirky Garden House Pottery, which has a lovely atmosphere. Nearby Muker also has a small gallery and shop packed with treasures - the Old School Gallery with a lovely little garden and honesty cafe. Almost next door is Swaledale Woollens. They stock an incredible variety of woollen goods, many hand-made locally by an army of around 30 people who hand-knit and crochet local wools. In Leyburn you'll discover Emma Sedman Jewellery, the Little Alf Shop, and other interesting and quirky shops. A very short drive out of Leyburn will take you to Tennants which has a small gift shop and when there's a auction sale on you could find a gift with a real wow factor. Just down the dale is Berry’s Farm Shop at Swinithwaite with a small range of locally made hand-crafted gifts. Over in Settle the Studio Vault in Settle is small but beautiful, featuring work by owner & jeweller Emily Knight, with changing displays of work by other makers. Gavagan Art is next door, with beautiful art, ceramics and glasswork. High quality presents for someone you love. At the nearby Lime Gallery in its stylish Courtyard setting you can find yet more potential gifts and work from rising star artists and makers. Town Head Farm Shop near Airton has an excellent range of gifts and products made in the Yorkshire Dales At the Stonegate Glass & Gallery in Ingleton you'll find a range of fused glass designs and custom-made items as well as work by other local makers and artists. Masham Gallery is full of carefully selected and beautifully displayed work by artists and makers from the Yorkshire Dales and beyond including atmospheric landscapes by Ian Scott Massie and delicate ceramic vessels made by Charlotte Morrison. Also in Masham is ​​Nolon Stacey’s Gallery featuring his very detailed, pencil drawings of British wildlife, dogs and farm animals. Just around the corner, Maureen and Tim Simon at Uredale Glass have been blowing brightly coloured glass for many years and their daughter, Zoe is now taking on the mantle, specializing in fused glass. 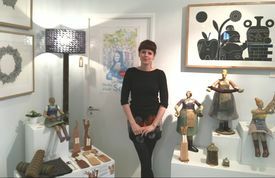 ​The Just Makers Gallery is just outside the Yorkshire Dales in Ripley and features makers from the local area. The shop at the Green Howards Museum has some more unusual gifts ranging from a trench map wash bag to an adventure kit or den-making equipment. Whether you want to treat your dog with a new lead or buy a barrier rope for your stately home, Outhwaites Ropemakers, is the place for you and is a long-established family firm. Make sure you go and see their braiding room and the long ropewalk where the twist is put into the rope! Campbell's in Leyburn is an unexpected delight – unveiling foodie delights and with a very extensive selection of fine wines. Ideal for picking up a picnic to enjoy on the Shawl when the sun eventually shines! Mainsgill Farmshop near Richmond has an incredible selection of local food, gifts and events to tickle your taste buds. ​​Look out for the assortment of animals near Berry’s Farm Shop at Swinithwaite or walk down the hill to see the waterfall before enjoying a meal or snack in the cafe. ​If you like cheese, you'll love the award-winning Courtyard Dairy where Andy & Cathy carefully select, mature and sell distinctive cheese from small farms and cheese-makers. 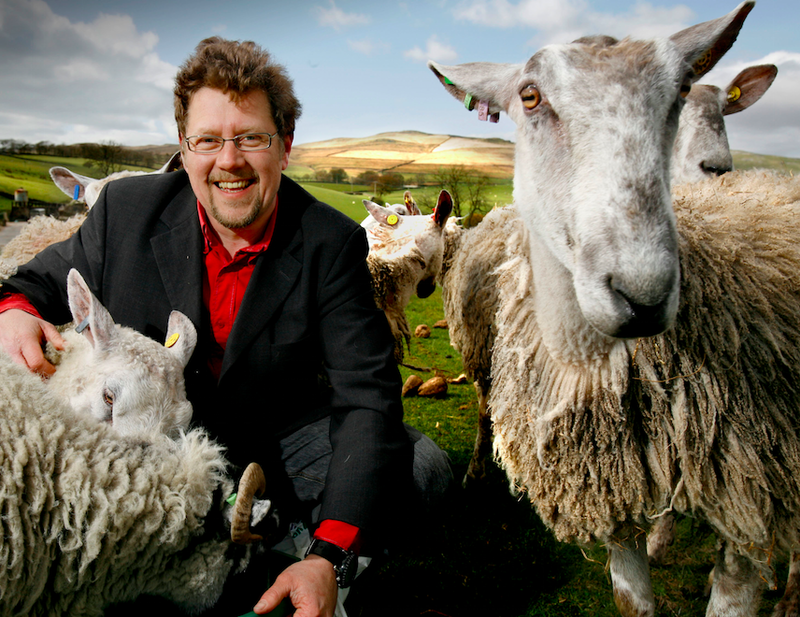 In food shops around the Dales look out for award-winning Ribblesdale Cheese, Swaledale Cheese and Shepherd's Purse. Hawes' most famous attraction is Wensleydale Creamery where you can see Wensleydale cheese being made and of course sample the finished product. The Town End Farm Shop at Airton by Malham is a great place to buy local food, as well as to enjoy excellent cakes, coffee and meals. Upstairs you'll find a really fantastic selection of gifts and home wares, many of which are lovingly created in Yorkshire. Keelham Farm Shop near Skipton has a fantastic selection of carefully sourced foodie treats, with a red tractor for a real wow factor! Country Harvest at Ingleton is a veritable emporium of food and gifts, with a great programme of demonstrations and events. Mocha Chocolate Shop in Richmond not only makes a wonderful selection of fine chocolates - they offer Golden Tickets for chocolate-making and tasting sessions! Chocolates and Truffles in Skipton make it easier for more people to enjoy chocolate with their diabetic and dairy-free ranges and a steady stream of new and innovative flavours. ​Chocolace in Grassington have a fine selection of confectionery, Belgian chocolates and fudge. Walkers on the Coast to Coast route surely deserve as many treats as they can carry from Kennedy's Chocolate Shop at Orton. Joneva in Masham have a great selection of chocolates, sweet treats and home made chocolate. Bah Humbugs offers you the chance to "step inside & be a child again" with all their retro favourites. If retro's your thing visit The Oldest Sweet Shop in England in Pateley Bridge. There's no shortage of shops around the Yorkshire Dales selling outdoor clothing and gear for climbing, walking, cycling and other outdoor pursuits. If you know someone who loves being outdoors, perhaps you could give them the chance to discover more of the Yorkshire Dales or to learn a new skill? No matter whether they are a beginner or an experienced walker, anyone with a love of the Yorkshire Dales will value a Where2walk voucher. Friendly, trained guides pass on their navigation skills or help walkers conquer the three peaks. Yorkshire Dales Guides also offer short courses in potholing, rock climbing and abseiling. There are plenty of books about walking in the Yorkshire Dales, but few are written with as much passion as those published by Skyware who created the Dales High Way and feature the Six Peaks. Jonathan Smith from Where2walk recently published a new book called 'The Dales 30' covering the 30 mountains in the Yorkshire and Cumbrian Dales that top 2,000 ft.
Wholesome Bee in Settle sells whole foods and cosmetics but their chunky knitted hats and gloves are likely to be in most demand for outdoor types. Nearby Lay of the Land is a great place to get gifts for a gardener. Give a wildlife lover the chance to photograph the rare and special red squirrel with Wild Dales Photography. Wildlife photographer Simon Philpotts will either spend the day helping to get the best possible images or hire his purpose-designed hide to help capture the beauty of these lovely creatures. Get adventurous with Camp Hill’s outdoor activity vouchers. These action-packed experiences are fun for all the family, ranging from Segway trekking to quad biking. 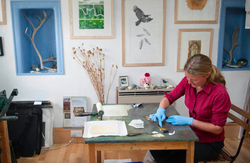 Print-maker Hester Cox’s detailed and very beautiful collographs and other prints are inspired by the landscapes and nature near her Pen-y-ghent home. Helen Peyton's reduction linocuts are often based on artefacts such as those in the Craven Museum's collection. Print maker Anna Tosney’s deceptively simple work features sheep, dry stone walls and birdlife deceptively simple. Moira McTague is very much inspired by nature in Nidderdale to create her incredibly detailed pictures and prints and Penny Hunt works in paint, print and ceramics. 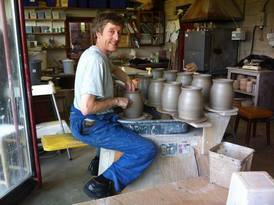 See sculptor Joseph Hayton at work in his King Street studio in Pateley Bridge. He works to commission, creating both figurative and abstract brass and stone sculptures. In the neighbouring King Street Workshops you’ll also find Sanders and Wallace Glassmakers, Fiona Mazza ceramics, and jewellers Moxon and Simm. Metal sculptor, Michael Kusz creates fantastical creatures and mythical beasts in his studio in Reeth. This is where you’ll also find cabinet maker Philip Bastow working with hardwoods to build high quality furniture, and Stef Ottevanger's animal sculptures. 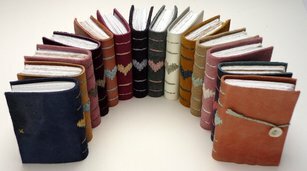 Kate Bowles uses recycled fabrics, leather, papers and assorted vintage haberdashery to bind her beautiful books. 'Page Paper Stitch' encompasses the work of three textile artists, Annwyn Dean, Joan Newall and Elizabeth Shorrock who all share a love of stitching and beautiful bookmaking. Clare Lindley uses papercutting techniques to create incredibly detailed and fine pictures inspired by the natural world. As you’d expect, wool features strongly in the Dales. In Sedbergh at Farfield Mill you'll find lovely Laura's Loom where Laura uses high quality Yorkshire Dales wool to weave items of beauty that speak of the surrounding landscape, the Howgills and their myriad details. 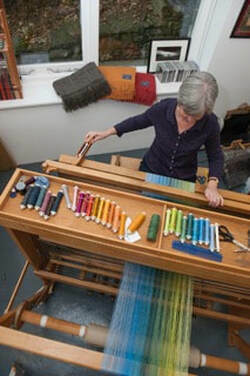 Textile lovers will enjoy browsing around Farfield Mill in Sedbergh where you can see huge looms, learn about the Terrible Knitters of Dent and see the work of the artists and makers who're based at the Mill. There are changing exhibitions so there’s always something new to see. There are more wool creations at Craftworkshop in Sedbergh. Lone Helliwell knits flowers, birds and other creatures in British wool. Andrea Hunter displays her unique felt pictures in her Gallery, Focus on Felt in the hamlet of Hardraw. Jo Hunter makes contemporary felt pictures and vessels while felt artist Em Fountain creates incredibly life-like animal sculptures such as hares. Louise Curnin is also a feltmaker and milliner, making felt pictures and functional pieces inspired by flora and surrounding landscape. Know a knitter who'd like some wool as a gift? Try Wensleydale Longwool in Leyburn or Purl & Jane in Skipton. Former tax accountant Annabelle Bradley designs and hand forges sculptural and functional wrought ironwork at the Malham Smithy. Lucy Sandys-Clarke often works to commission from her hidden smithy in Dent, producing domestic items such as window and door fittings. Emma Sedman is a contemporary jewellery designer and maker working with silver and enamel in Leyburn, using single transparent colours fused within geometrical shapes. The Yorkshire Dales has several potteries: Bentham Pottery, Ingleton Pottery, Garden House Pottery, Rachel in the Dales Pottery. Each has its own distinctive style, but all focus on handmade pots using traditional methods. The Sedbergh Soap Company was founded by Dorothe Pratt, a long-time eczema sufferer, who started making her own soap for sensitive skin. The range has now expanded to include gorgeous goodies smelling of lavender, lemongrass, tangerine, and geranium. Flavours from the Littlecote Soap Shop at Bolton Abbey range from White Wine and Fig to G&T and they even have a Red Wine and Cassis Bath Fizz Soak! You can often see candles being made at the White Rose Candles workshop in Wensley. Barn Craft have created a range of beautifully scented, natural soy wax candles with seasonal fragrances. More artists who live in and near the Yorkshire Dales and who are inspired by the local landscape include painter Margaret Uttley, David and Heather Cook in Malhamdale, Malham's Katharine Holmes, portrait painter Sam Dalby, creative landscape painter David Knight in Settle, Lynn Ward and Denise Burden in Leyburn, Judi Allinson in Scorton, mosaic artist Ruth Wilkinson and Sarah Garforth who works in her Ramsgill Studio in Nidderdale. Katherine Whitby paints fine birds and Yorkshire Dales barns. Jacquie Denby creates vivid abstracts. Jo Garlick usually works in pastels to create very lifelike images of animals and the natural world. Anne Mackinnon is also inspired by local landscapes and the patterns and shapes to be found in nature. Fine artists Rebecca Wallace Jones and Pip Seymour have joined forces and now produce unique ranges of oil, acrylic, watercolour, gouache, hand-made soft pastel, hand-made drawing materials, primers and painting mediums from their base in Horton in Ribblesdale - selling these via stockists throughout Europe and the UK. PLEASE NOTE: Before setting out on a long journey, we recommend you double-check opening hours as some smaller businesses may close for some of the time during Winter time.